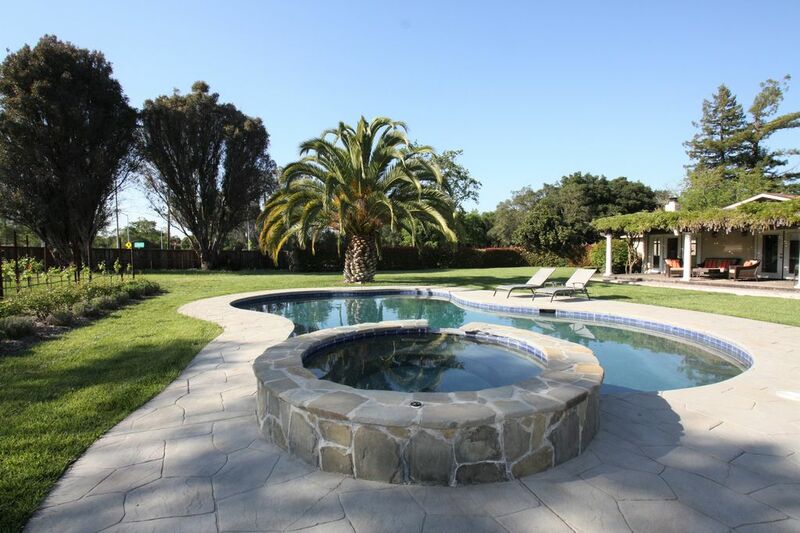 Beautiful Wine Country home on just under one acre of land, Hobby Vineyard, with a Large Saline Pool and Elevated, Stone, Hot Tub that flows into the pool. Casa Sonoma is 5 minutes northwest of the Sonoma Square towards the Sonoma Valley Wineries. Napa is 20 minutes away. The home is an updated ranch-style home, 1800sf. Wood floors, fireplace, crown molding, open kitchen with granite counters and stainless-steel appliances. The house has three bedrooms. The Master Bedroom has a Queen Size Bed and the remaining two Bedrooms each have a Queen-Size bed. The master bedroom has a spa tub for two, shower and private bathroom. The other two bedrooms share a full hallway bathroom. Flat Screen HD TV, Cable, Stereo and High Speed Internet provided. This is not a typical rental; very classy home, and many repeat guests. Very private backyard without neighbors nearby. This is not our primary home so you will NOT see any personal items at the house. Born in the midwest and attracted to the bay area because of San Francisco, Wine Country, the Coast and Lake Tahoe...We love to travel the world and enjoy to hear our guests stories. Location, Privacy and Relaxation. We are close to San Francisco, the Coast and Napa, all of which make for a great vantage point to enjoy the many facets of Northern California. Towels and Bedroom Linens included. Suggest bringing beach towel for pool. We don't provide spices however, past guests usually leave spices at the house. great place anytime of year! House was very comfortable and centrally located in Sonoma, just a few miles from town. owner was great and responded whenever we needed anything. 3 couples fit comfortably in this 3 bedroom, 2 bath house. Backyard was very large with pool and hot tub, would be great summer get a way! fire pit added a fun night after wine tasting all day! We loved Casa Sonoma. It is a comfortable, well appointed property with beautiful grounds. Unfortunately for us, but not for Sonoma, it rained for most of our stay. So we couldn't enjoy the pool, yard and patio as we'd hoped. Tom was responsive to our questions and even got a crockpot and roasting pan for our Thanksgiving turkey. We will be back! Beautiful Home! Owners were easy to reach and very accommodating! Back yard space is heaven, we spent every night outside enjoying a glass of wine! Plan on returning! This is our second time staying at Casa Sonoma and we love it. Tom is very responsive and helpful. Highly recommend it! What a terrific place! Tom was unusually responsive and helpful. The house is about a 10 minute drive into town. The kitchen is well equipped, the bedrooms and living room very comfortable. All amenities are of high quality. The highlight for us was the beautiful yard with pool and hot tub. There was a little noise from the street but that did not prevent us from spending lots of time relaxing outside. We may choose to vacation in Sonoma again just to stay in this perfect spot! We had a very relaxing stay at Casa Sonoma. The house is lovely with classy decor and everything you need. We took advantage of the large garden with lots of different seating areas and most of all the pool. Only a short drive to Sonoma or Glen Ellen which is a fav village of ours. Tax is 12%; There is a special event surcharge of $1,000 in addition to the nightly rate. Any special event is 12 or more people.